2. On March 14, Ahwaz steel workers held their protest in front of Ahwaz Governorate for the twenty-third day. The workers chanted slogans against the government and in favor of the workers’ rights. The protesters formed a human chain in the streets leading to the governorate and demanded the presence of governor. 3. Farmers in the eastern villages of Isfahan who demand their rights to water of Zayandeh Rood River continued their sit-ins and protest at the shore of the river. 4. Thousands of people from Chaharmahal and Bakhtiari rallied in protest of the regime’s devastating policies regarding the agricultural water situation and the misery of the residents of villages and cities and chanted slogans in this regard. 5. Farmers in the Sheikh Ajam village in the Fath al-Mubin district of Shoosh called for the allocation of agricultural water to their farms by gathering at water gates. 6. A group of educators and their families were arrested in protest at the arrest of Mohammad Habibi, the teacher who was arrested at his school in Shahriar. 7. Workers in Phase 14 of South Pars in Kangan went on strike in protest of the failure to pay their delayed salaries. 8. 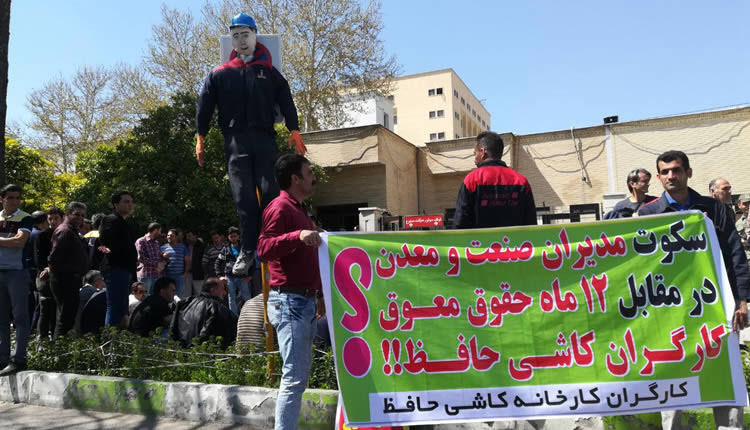 Workers at the Hafez Tile Factory in Shiraz, who have received no salaries for one year, set up a protest rally in front of the governor’s office. 9. 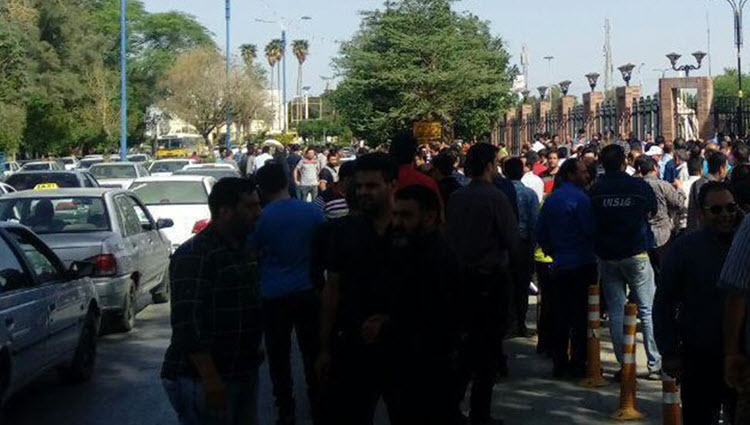 Iranian metallurgical powder workers in Qazvin gathered in front of the governorate in protest against the non-payment of their salaries for six months as well as their New Year bonus. 10. A group of Qazvin meter producing factory workers who have been deprived of their salaries and benefits and have not received their New Year bonuses of 2016 and 2017 protested in the factory premises. 11. Persian Gulf Hospital personnel in Bushehr gathered to protest against the non- payment of their delayed salary. 12. Protest gathering of drivers of Tehran and Suburbs Bus Company in front of the municipality and city council continues after four weeks. They demand the delivery of their houses they have paid for five years ago. 13. On Tuesday, port service workers of the Khomeini Port ferry company gathered in front of the General Directorate of Ports and Maritime of Khuzestan Province. They object to a bill that reduces the salaries of the sailors and other workers of the company from the beginning of the Iranian new year. According to this bill, the fee for service of 400 sailors and simple workers of the company, which ranges from 500,000 to 1 million Tomans (one quarter or one eighth of the poverty line), will be even less, and the workers will be in a much worse situation. 14. The people looted by Caspian Institute in Rasht gathered in front of the Golsar Branch of the Institute. They chanted: “Iran’s banks are thieves; they steal your money”; “Demand of every Iranian: Rouhani’s impeachment”; “We do not want promises; we want our money”. 15. Dismissed employees of the Gachsaran oil and gas company gathered outside the building of the company in protest at expulsion, several months of uncertainty, and lack of payment of their delayed salary. 1. Workers of the Natanz steel and smelting complex continued their strike for the second day in a protest against the non-payment of their months of past due salaries. 3. Workers from Ahvaz Sewage & Water Septic Company gathered in front of the company in Kianpars to receive their three months’ overdue salary. 4. Tehran City Municipal contract workers protested against the failure to pay their salaries by gathering in front of the municipality building. 5. The workers of Iran Poplin’s company in Rasht protested for the second day against non-payment of three months’ salary, as well as their new year bonuses. 6. The employees of the Zamyad Automobile Company protested for delay in paying their salaries and bonuses. 7. A group of retired people from Kohgiluyeh and Boyer Ahmad gathered in Yasouj to protest against the imbalance in salary and failure to pay their claims in front of the regime’s governorate. 8. A group of municipal workers in Abadan protested against not paying 9 months of their salary and four years of insurance premiums. 9. The dismissed staff of the Arman Vahdat Institute (nations) gathered in Khorramabad in front of this government’s fraud institute. They object to their dismissal and the failure to pay their salaries, benefits and new year bonuses. 10. A large crowd of people in Kashan protested the deteriorating state of roads and accidents causing their loved ones to die and closed off the Kashan to Barzok road. 11. Protest rally of civil engineering students continued for the fifth time in front of the regime’s parliament in Tehran. They have been discredited because of the changes in the titles of engineering bachelor’s degrees, and their employment status is compromised. 12. “Snap” taxi drivers in Isfahan protested against unfair fares, which poured into the pockets of the regime’s leaders. 13. Protest gathering of a group of Tehran and Suburbs Bus Company drivers for five-year delay in delivering their homes entered its fourth week. 14. The looted people of the Velayate Andisheh gathered to protest the plunder of their deposits in front of the regime’s parliament. 17. A group of employees of the Edalat Equity Cooperatives gathered in protest of the uncertainty about their job status and the failure to pay their outstanding salaries. 18. The residents of the Ashk Talkh Street in Kermanshah gathered to protest the five-month uncertainty and lack of accountability of the mayor of the region to pave the street. Protesters of Pabdana coal mine workers in Zarand, dismissed workers of Gachsaran oil and gas company, workers of Slaughterhouse of Ilam Dam, workers of Shafarood dam in Rezvanshahr, workers of Iranian aluminum production factory (Iralko) in Arak, workers of Hamedan and Bushehr municipalities, as well as protest of looted people of state institutions in Tehran, Mashhad and Zanjan and dismissed employees of these institutions, protest by a number of merchants of the Plasco building in Tehran, and the protest rally of the ravaged people of the Kouye Ali Abad in the Barval district of Ahvaz were among the protests of Saturday March 10. 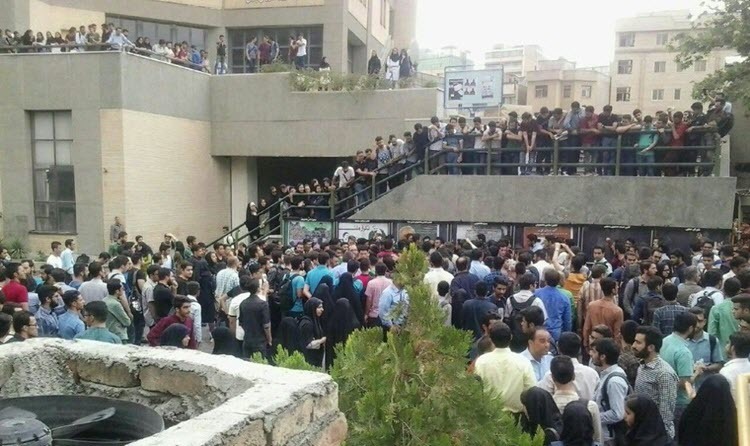 NCRI – Students from the University of Amir Kabir (formerly Tehran Polytechnic) staged a rally and issued a statement in a protest against the arrest and detention of their classmates. They demanded to resolve the current security atmosphere of universities and abolish the prosecution of students detained in the early January protests. On Sunday, March 11, protests and strikes became more widespread. In addition to farmers in Isfahan, the families of the detainees, workers, students and various walks of people staged demonstrations and protest. 1. Students at the Polytechnic University in Tehran demonstrated and protested against the issuance of heavy sentences for students arrested during the January uprising. While carrying the photos of arrested students, they chanted: “Imprisoned student must be freed”; “political prisoner must be freed”. Basij militants attacked protesting students, battered them, and tore the photos of imprisoned students. Students confronted them chanting “shame on you”. 2. Families of those arrested on the International Women’s Day (March 8th) gathered in front of the Evin Prosecutor’s Office and the Ershad Court in Tehran for several consecutive days for the release of their relatives. The regime’s judiciary officials refuse to respond to them. About 80 women were arrested in front of the regime’s labor ministry in Tehran during the International Women’s Day demonstration, where at least 20 of them were taken to jail. 3. The strike of Ahvaz steel workers continued for the twentieth day. They gathered outside the Khuzestan governorate and chanted slogans such as: “We shall resist, we shall die, but we shall get our right back”, “Death to the oppressor, hail to workers”, etc. 4. 200 retired Ahvaz steel workers marched in the city following their protests the day before and after they gathered in front of the Pension Fund. They chanted: “Resign incompetent minister!”, “Our problems will be solved with just one less embezzlement”. They also revealed, with their slogans, the lies of Nobakht, the spokesperson for the Rouhani government, and regime’s other officials who have looted the assets of the fund.